I've already given my main objections to "Gridlock Sam" Schwartz's plan to toll the East River Bridges and use some of the money to reduce tolls on the MTA bridges that don't go to Manhattan. I've talked about how Schwartz goes out of his way to provide "something for the drivers," but fails to give them what they really want: validation of the status that they sought by becoming drivers in the first place. I've talked about how this "something for the drivers" is not about compensating the current drivers, but sinking money into durable infrastructure for anyone who will drive in New York City in the next thirty to fifty years. This is not a vision of a sustainable future. I'm very much in favor of using highway rights-of-way for transit, for a number of reasons linked to my goals (see above). Reducing highway capacity discourages driving. A dedicated right-of-way with grade separation allows transit to move faster, making it more competitive with driving and thus improving ridership and revenue. Using a highway right-of-way enables grade separation without expensive tunneling or property condemnation. But these elevated busways are probably the worst possible way to provide a dedicated grade separated right-of-way. First of all, Schwartz's proposed elevated busways are expensive. Part of the success of the Lincoln Tunnel XBL comes from the fact that it uses lanes that are already there. The only additional expense is moving the bollards. In contrast, Schwartz's proposal would leave all of the existing lanes for private vehicles and construct expensive elevated roads above them. Second, the proposed busways do not take existing car lanes. The famous BRT of Curitiba, Bogotá and Guangzhou take lanes away from cars and trucks, thus reducing the competition from government-subsidized private vehicle travel. Schwartz's proposal would actually increase the available road space for private vehicles by removing buses from the roadway. Third, they are still busways. The only reason to run buses instead of trains is that they can use existing road infrastructure. If instead you're going to construct an entirely new platform, it is much more efficient to put tracks on it. Fourth, Schwartz gives no thought to Manhattan terminal capacity. More than anything else, this is what convinces me that he just tossed this in to please transit advocates (or bike advocates who spend some time on transit issues). How does Sam Schwartz expect the bus riders to get to their jobs in Manhattan? Does he just want to terminate the busways at the bridges and tunnels and have them fight their way through against private cars? Does he really not know that when the DOT tried to build a dedicated busway on 34th Street, they were defeated? Does he not know that there's an organized movement with political clout fighting against bus stops in Manhattan? Schwartz's plan is sold as being more politically and financially viable than the plans put forth by Bloomberg and Ravitch. If you build proper terminals for these busways in Manhattan the plan becomes financially unviable, and if you use the existing streets and curbs in Manhattan it becomes politically unviable. Nice try. Do you have evidence that Sam is planning median lanes on some kind of massive structure like the AirTrain or LA's Harbor Transitway? 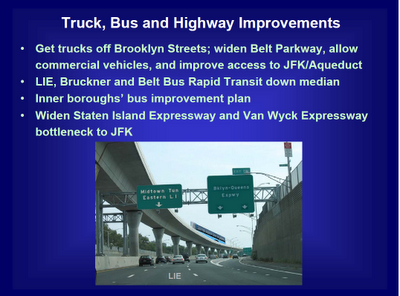 Maybe the plan does involve taking existing lanes from the LIE/Bruckner/Belt. The photos used in presentations are usually pretty generic; the NY metro doesn't have many examples of median transit, because Moses was diametrically opposed to transit expansion and all the suburban lines predate the highways. The shot of AirTrain is just a local example for how a highway corridor can have transit integrated. It's worse than that. Eastern Queens and Southeast Brooklyn love their express buses. They don't have to demean themselves by riding the subway, and the high fare and carefully selected stopping pattern keep away the riff-raff. The only problem is that they're very heavily subsidized. Those poor shlubs who cram onto the Queens Boulevard line subsidize their far wealthier eastern neighbors who ride the express buses. If we invest in facilities for express buses, then we're investing in a system with very high operating costs that only serves a small portion of the city's transit riders. Schwartz could instead use the funds to improve and expand the subway system, speed up the local bus system, and improve transfer facilities between the two. That would benefit a wide range of riders, riders of all income brackets, in neighborhoods near and far. But that wouldn't be a special gift to Eastern Queens and Southeast Brooklyn.